Not loving the way your hair feels after you shower? Well then you have come to the right place. 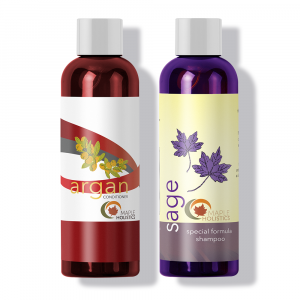 Maple Holistics produces products with quality ingredients that help to cleanse and nourish. 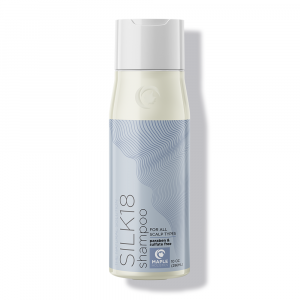 We recently released a brand new product, Silk18 conditioner, which we made sure to be the best hair conditioner possible. Whether your hair is naturally silky smooth or full of knots, this conditioner is for you! 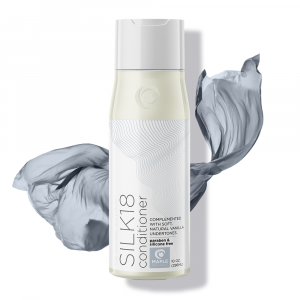 The new Silk18 conditioner uses the finest blend of conditioning agents to maximize hair smoothness in a manner which doesn’t involve potentially harmful additives. We have done everything we can to provide the best conditioner possible! I am sure you are all dying to try it. This new conditioner targets all different types of hair. Anyone can use Silk18; it is a universal masterpiece. Of course you all know that shampoo and conditioner are two very different things. If they were the same why would we use both? But, do you really know the difference between the two besides for the difference in name? Contrary to popular belief, shampoos were not designed to be effective on your hair, but rather work to keep your scalp clean and free of germs or bacteria. Shampoo essentially cleans your hair by grabbing onto the dirt and oil that builds up in your hair. Even the vitamins and nutrients contained in shampoos and conditioners are different. The vitamins found in shampoos are formulated to target the roots and scalp. Whereas for conditioner the vitamins target the hair strands to strengthen it and prevent it from becoming brittle and prone to split ends and breakage. Conditioners are specifically formulated to work on your hair follicles and are therefore milder than shampoos. In most cases, conventional shampoos strip your hair of the natural oils and proteins that keep it strong and healthy. This is why it is essential to follow up with conditioner, don’t skip this step. Especially in the winter when your hair tends to dry out, conditioner will eliminate your dry flakes and make your hair smooth and silky. There is a surprising amount of science that goes into making an effective conditioner. In short, your hair is made up of a series of dead skin cell that are negatively charged. They are bound together by a naturally occurring protein known as keratin. Conditioner is a positively charged substance, which is made up of natural and chemical ingredients. Although, Silk18 uses purely natural ingredients as they are healthier for you in general. Some include, surfactants, emollients, minerals and vitamins. These all work to replace the natural oils and proteins that are stripped away when using a conventional, non natural shampoo. When you wash your hair with conditioner, the conditioner becomes attached to the hair follicles. This ultimately forms a protective layer around the hair which locks in moisture. Due to the fact that conditioner is positively charged, it helps increase the hydrogen bonds between the cuticles in your hair. This keeps them closer together and increases your hair’s natural sheen as well as increase your hairs volume. This is because the hair follicles are able to reflect light and retain oil better. Using a conditioner on your hair is one of the most important steps with regards to retaining your hair’s natural moisture and sheen, as well as maintaining healthy, strong hair in general. But. even better than that is using a natural conditioner. Natural conditioners are ones that are free of harmful chemicals. Those include, Sodium Lauryl Sulfate, iodopropynyl butylcarbamate, parabens, colours and fragrances among others. All of those chemicals can have a negative impact on the quality of your hair and even your health in general. With a natural conditioner such as the Silk18, these chemical ingredients are replaced with natural alternatives that give you the same kind of results that you’d expect from a conventional conditioner, without the risk of damaging your hair or your health in anyway. 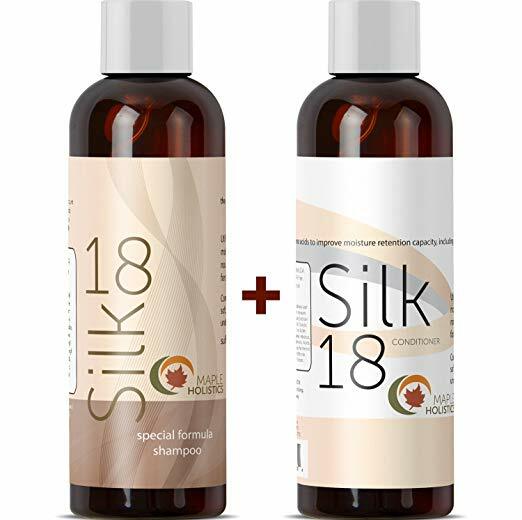 Silk18 Conditioner has been specially formulated to nourish your hair from root to tip with an excellent selection of natural ingredients including Moroccan Argan Oil, Silk Amino acids, Green Tea Extracts and many more. The Silk18 Conditioner is perfectly suited for treating dry and damaged hair and is also suitable for all hair types, including color treated hair. Silk18 conditioner is a huge hit! Silk18 is a masterful blend of harmless conditioning ingredients that are all natural and amazing for your hair. To help do the job, we’ve added a maximized portion of silk amino acids. These aren’t fake chemicals: naturally derived from silk are eighteen different silk amino acids which have marvelous benefits to “behind-the-scenes” of conditioning. Additionally, Botanical Keratin helps boost the conditioning effects by contributing volume to the hair, as well as two high-end oils for glossy undertones and, last but not least, real and pure vanilla for a pleasant, natural scent. The ingredients that are used in Silk18 conditioner are not full of chemicals that damage your hair like regular conditioners. Silk18 is milder on your hair compared to non natural conditioners which are normally harsh on your hair and can cause real damage. People say it is the best conditioner they have ever used, it helps with dry hair and creates frizz-free hair. Anyone you ask will tell you that after a few times of using the Silk18 conditioner your hair is instantly different. It’s silkier and less frizzy and is a fan favorite. It leaves an amazing light smell once your hair has already dried. Once you wash it out you can immediately begin to feel its effects. 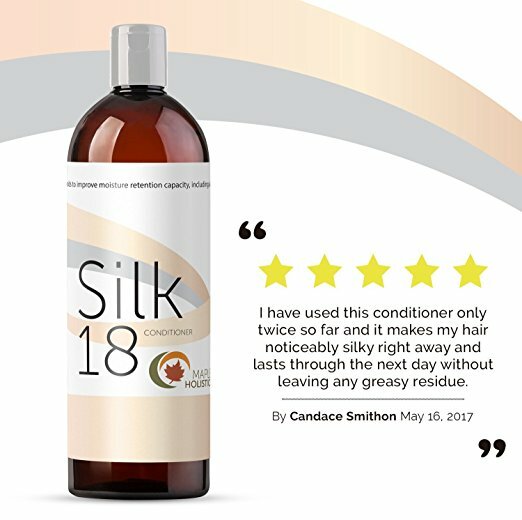 It is loved by many so don’t miss out on your opportunity to try Silk18 conditioner! Why stop at conditioner? 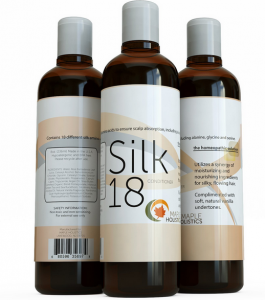 Maple Holistics is now introducing the brand new Silk18 shampoo! It helps hydrate and moisturize your hair leaving you with an amazing shine and glow. The brand new shampoo re- energizes your hair and revitalizes your roots. 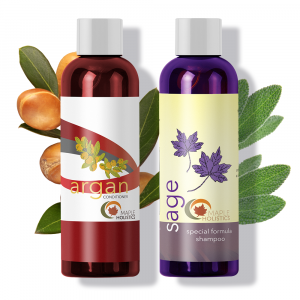 The shampoo is also made with natural oils and wholesome ingredients such as Argan oil, Jojoba oil, Shea butter and so much more. It has no sulfates, no unnecessary additives, and it uses amino acids and essential oils instead of synthetic fragrances. The best part about it is that the shampoo and conditioner come as a set! So if you already love the amazing Silk18 conditioner you are guaranteed to love the shampoo as well and you can simply buy them as a package deal! Sounds amazing to me. Check out more of our amazing products at Maple Holistics! If you can’t seem to get your hair looking the way you want it to, or your hair is a frizzy mess, try Silk18 shampoo and conditioner. It will change your life. Why wait? It is available now so take action and start using the Silk18 shampoo and conditioner set to improve your hair. When your hair feels good, you feel good.